Purchase this product now and earn 7,551 Reward Points! 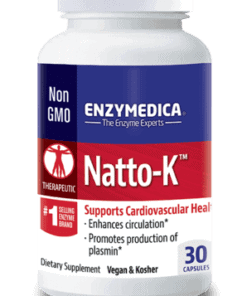 Natto-K™ is a proprietary blend containing the enzyme Nattokinase NSK-SD, which has been shown to have a high fibrinolytic activity (breaks down fibrin) and antioxidant activity. Suggested Use: 1 capsule of Natto-K right before bed. For a therapeutic effect, 1 capsule 3 times a day on an empty stomach. More can be taken as needed (up to 6 a day). 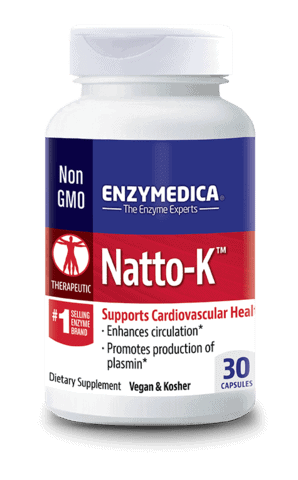 Additional Information about Natto-K: Nattokinase breaks down fibrin. Fibrin is a protein that forms in the blood after trauma or injury. This is essential to stop excess blood loss but excess fibrin has been shown to contribute to cardiovascular issues, poor circulation and slow tissue repair.